About Paola M. Message Paola M.
Paola was amazing. We really had a wonderful time with her in Lucca. Our family really enjoyed cycling on the city wall especially when we had to bike down those eerie tunnels to get to see amazing art installations inside. Paola shared a lot of knowledge about her Lucca and our kids were so intrigued by those tales and stories from the past. We ended our day making and trying gelato. Just wonderful. Paola was really great! She showed us the most beautiful churches, streets, homes, and piazzas, and told us so much about the history of Lucca as well as the current traditions and festivals. The walk on top of the walls and underneath in the tunnels was amazing. Paola's English was perfect and she answered any questions we had for her with ease! We would highly recommended Paola's tour to anyone visiting the beautiful city of Lucca!! TOUR GUIDE RESPONSE: Hello Ashley! Thank you for your feedback. I have to say we had quite a day, full of surprises so I am sure you will have something to tell back home of your time in Lucca. Paola provided a very well organized tour for us in Lucca as well as a wine tasting and lunch in the Chianti countryside. Her driver took us back to our port. Wonderful day, great wine and fantastic lunch. I booked a custom tour with Paola for me and 3 family members for our first full day in Tuscany. Paola designed a day for us that involved visits to a local cheesemaker, a local biodynamic winery, the Verrucole fortress and the beautiful town of Barga. The tour was the perfect introduction to the Garfagnana region north of Lucca and Paola provided a wealth of information and suggestions for things to do the rest of our stay. She was a true delight and an excellent guide. The best! What an amazing morning we spent with Paola as she shared interesting information about her beautiful home town. Cycling along the walls was the best way to experience Lucca. Paola's tour had just the right balance of fun and history to keep our children interested. The transport from La Spezia that she organised for our family group of 9 was efficient, comfortable and on time. Rounding off the morning with a tasting at a local gelataria was fabulous. I can highly recommend this tour with Paola. TOUR GUIDE RESPONSE: Thank you so much, Leigh! I think I will hardly forget our morning together. Thanks for your patience as it took me some time to arrange everything but it was quite a busy day. It was a pleasure to meet you. This tour was created for children but somehow everybody enjoys it! Paola was a great host and provided a very informative tour to her home. As her tour description states, she really is Lucca; she is proud of her heritage and is very knowledgeable about her home. We met just outside the walls at Bar Stazonie, which she used to guage what we were looking for and what we wanted out of the tour. She did not disappoint. You will not see one city on this tour you will see three. As a histroy buff, I had a great time and Paola knew the regions and Lucca's past. TOUR GUIDE RESPONSE: Ciao Dale and Donna, your feedback made my day and it will keep me going for the future and it really means a lot to me! You definitely have to come back, because we can explore even more! Grazie mille! :) I am glad you appreciated the history, the new discoveries and the atmosphere. One of the best, most friendly, most accommodating tour guides and every use. We had our six-year-old grandson with us and she planned the day perfectly from riding bikes around the walled city to making gelato. A perfect day and most memorable! I would highly recommend her if you have children. She's terrific! TOUR GUIDE RESPONSE: Hello Leslie! You are too kind!! The tour was a success because your grandson is such a lovely kid. I think you chose the right tour and the right place to spend some time with him. He was so happy on the bike! I am sure he will remember this experience. Thanks again for your great feedback! Lucca is a well-preserved city with many historical features. We were interested in these but had also asked to learn a bit about modern life in the ancient city. Paola did an excellent job of addressing our interests both ancient and modern, combining an outline of the city's history and features with some glimpses into life as a local in current times. She was informative, relaxed, and amusing and we thoroughly enjoyed the tour. The tour and the guide are highly recommended. TOUR GUIDE RESPONSE: Hi Gordon, thank you so much for your feedback. It was quite a funny day with all those vintage cars around! Nice to see you the day after wandering... Lucca is a small city, but it is full of treasures. I always like to combine ancient and modern times, because I consider the city something alive with its own rhythm. A presto! We had a wonderful tour with Paola! She was very knowledgeable and friendly and was great with our kids! I would recommend this tour whole-heartedly! TOUR GUIDE RESPONSE: Thanks, Mark! Hope you will remember that gelato! Glad that kids enjoyed the tour and the excitement for the Comics festival. The tour was exactly as advertised and what I was hoping for. We finished off our morning with a bike ride around the walls which I would highly recommend to complete this tour. Paola gave us great introduction to a lovely lively city at just the right pace, including easily arranging the bikes, and we used our new knowledge of the city to have dinner this evening outdoors in the amphitheater. Thank you! Paola was terrific. She has an intuitive sense of how to tailor a tour to a client's specific needs. I would not hesitate a minute to recommend her. TOUR GUIDE RESPONSE: Hello Robert, grazie mille for your wonderful review! How is your Italian going? Hope the Lucca is treating you good! Our group of 14 had a delightful day with Paola. Paola was fluent in English, warm, friendly, knowledgeable and passionate about Lucca. We had a wonderful time seeing Lucca through her eyes. Paola made arrangements forgot everything. At the end of our tour in Lucca, the bus took us to Pisa allowing us to tour Pisa on our own and returned us to our ship at the end of a great day. A fantastic day! TOUR GUIDE RESPONSE: Hello Mary Ann, thank you so much for taking the time to leave me a feedback. It was a real pleasure to work with you and hope there will more chances in the future. I am happy that everything went smoothly. Having Paola as my tour guide was like spending a few hours with a trusted friend. Paola spoke of Lucca in a conversational style that made the tour more about relaxing, and enjoying, rather than a lesson in Lucca history. We meandered around Lucca, all the while Paola sharing some extra tidbits about local culture, as well as talking about Lucca's rich history. I did the garden tour on the morning of my last day in Lucca ~ perfect. This tour, and Paola's guidance were great! Thank you Paola!! We did a couple hour tour of Lucca with Paola. She was extremely knowledgeable about the history and could answer any question we had about the town. We really enjoyed Paola's company, it felt like we were meeting someone we knew already for a stroll through town. Highly recommend Paola, great lady with a wonderful personality. Thank you Paola, Ciao! Paola is a wonderful guide adding lots of great stories to the basic history of Lucca. She knows Lucca. Excellent English. TOUR GUIDE RESPONSE: Thank you very much, Bill. I met your friends the day after as they missed just one tower to climb in Lucca. Hope you will have a nice memory of your stay! Paola was a highlight of our trip. She was knowledgeable, friendly and dealt with our 3 young kids wonderfully. We had one woman in our group who had foot problems and Paola went very slow to accommodate. Thoroughly enjoyed our tour. TOUR GUIDE RESPONSE: Hi Andrea, thank you for your feedback and for your visit to Lucca. It was a lovely day and your kids were so cute! Touring with Paola was fantastic! We learned so much about Lucca and she tailored our tour to our needs even in the moment. Paola's friendly and easy demeanor and knowledge of the local architecture, history and important modern events made our experience in Lucca much richer. TOUR GUIDE RESPONSE: Hi Jen! So happy to hear from you! :) Grazie mille for your words and to leave a positive review after some time, so it means I left you a good memory. We had a great time wandering around the city! Thanks! Lucca is a very beautiful small city and I had a great time on this tour with Paola. She is very knowledgeable about the city, both its history and about the sights that are available to see. I had a great wine tasting that also included a sampling of the local salami and cheeses. I recommend this tour and Paola as the guide. TOUR GUIDE RESPONSE: Grazie Michael, I really enjoyed our Italian conversation, hope it was a good practice for you! This was the first time in Lucca for my family of 8 adults. Paola provided us with a wonderful opportunity to experience Lucca on bike, all while interjecting interesting facts and history. My family loved it and all agree it was one of the best tours! At the end of the tour, Paola took us to a great place to eat lunch, which we would not have found on our own. TOUR GUIDE RESPONSE: Thank you so much, Cheryl! Yes we had a great time and the day was wonderful for a bike ride! I am glad you enjoyed my storytelling and the food suggestions! 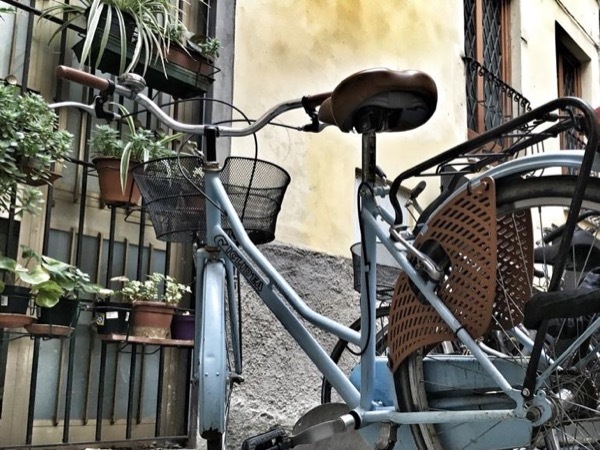 Great Lucca introduction for family and kids, including grand kids: the bike rental agency was extremely helpful, the wall biking fun and explorative, the ice cream tasting enjoyable and Delicioso. Paola explained very clearly and connected well with all generations in our party of 12. Thanks. TOUR GUIDE RESPONSE: Thank you very much, Eddy! It was my pleasure to introduce you and your family to my city. Grazie!